Yesterday, I noticed this article on Railnews which was entitled National Rail Trains To Score Heritage First. This was the first two paragraphs. Scheduled National Rail trains will run on a heritage railway tomorrow for the first time. South Western Railway is launching Saturday services to Corfe Castle on the Swanage Railway, and Corfe Castle has been restored to the national stations database. So I thought, I’d be on the first South Western Railway train on a scheduled service into Corfe Castle station on the Swanage Railway. I caught the 08:25 train from London Waterloo to Weymouth and I alighted at Wareham station to catch the 11:12 train to Corfe Castle. These pictures illustrate my trip. I came down from London, so I had to pay for that ticket, but train tickets to Swanage from Wareham cost me five pounds for the South Western Railway leg and ten pounds for steam haulage. \everything was very professional and there seamed to be a high-level of communication and good humour between the staff of South Western Railway and the volunteers of the Swanage Railway. Swanage Railway were operating a stem-hauled shuttle along their line between Norden and Swanage stations and as the pictures show, both companies were able to run their own services, without interrupting the other. Does Swanage Need A Year Round Train Service? After my father retired, my parents went to live in Felixstowe. It certainly didn’t work for me, as it was not the sort of place, a late teenager, could amuse himself, especially as all my friends were in London. As we hadn’t sold the house in London, I was usually to be found there. I don’t know Swanage and I don’t know what it is like to live there! But I do remember a short film on the BBC program Tonight in the early 1960s. They were talking about long-distance commuting and they used as an example, a guy, who had moved his family to Swanage and was leaving home very early in the morning to go back to London for his work. He was very happy with the arrangement, but the last shot of the film was after the reporter had asked his two teenage daughters what they thought of it all. Their faces said it all and I can remember by mother made an acerbic comment. I wonder what a year round hourly service would do for Swanage? Felixstowe has an hourly rail service to Ipswich, but then Felixstowe is over twice as large as Swanage. On the other hand, Felixstowe has a fast dual-carriageway road connecting it to the rest of East Anglia. Unlike many rail schemes aiming to create a new branch line, a lot of infrastructure is already in place. Yesterday, the following services were running. A roughly hourly steam service between Norden and Swanage stations, run by the Swanage Railway. A two-hourly service diesel service between Wareham and Corfe Castle stations, run by South Western Railway. The track, which is a mixture of single and double track, seemed to cope well. Interestingly, there is a mothballed oil terminal at Furzebrook, which was used to export oil from the large field at Wytch Farm. It is connected to the Swanage Railway between Norden station and the South Western Main Line. As development and exploitation of oil fields is a very unpredictable process, I suspect that the Northern section of the Swanage railway is kept in very good condition by Network Rail, just in case Furzebrook has to reopen. Norden station is the Northernmost station on the Swanage Railway. 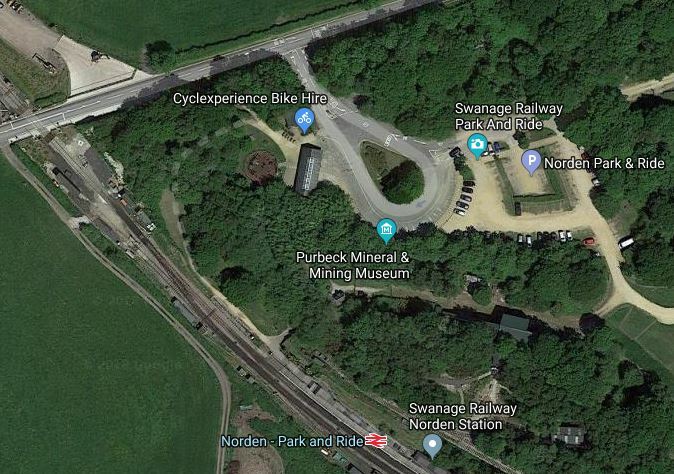 The map clearly shows the single platform, the Purbreck Mineral and Mining Museum and the Swanage Railway Park & Ride. The Wikipedia entry for Norden station, says this about the car park. Could this car park, also be used by local residents wanting to commute to or go shopping in Poole or Bournemouth? Corfe Castle station is a well-built station with two platforms and a footbridge, that is as good if not better than many rural stations. Harman’s Cross station is a two platform station, without a footbridge. It appears from the Google Map of the area, that new houses are being built in Harman’s Cross. Swanage station is the terminus station with two platforms. As the pictures show, the platform used by the steam train is long and would certaining take an eighty metre long train. I suspect that on days, when the heritage railway is not in operation, that the Swanage Railway could be used as a single-track branch line. So perhaps, a diesel multiple unit could run a passenger shuttle along the branch. Operation would be little different to any of several diesel-operated branch lines in the UK. Surely, if the CAA can allow Loganair to use Barra Airport, which is a beach on the island of the same name, then the ORR must be able to write a sensible rule book, to allow an hourly passenger service between Wareham and Swanage. This picture shows Zwickau Zentrum station in the centre of the German town of Zwickau. It is the simplest station, I’ve ever seen in a town centre. The diesel multiple unit appears to come into the city under the following rules. 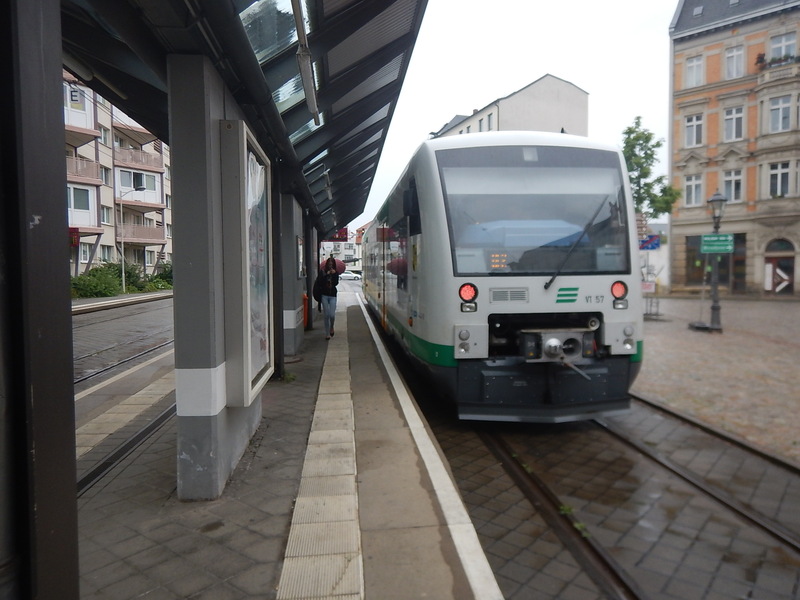 Effectively, the train service in Zwickau is run like a tram and even has a three-rail track, that it shares with metre-gauge trams. Note that as the Swanage Railway is a heritage railway, the speed limit is only 25 mph anyway. As yesterday showed, South Western Railway and the Swanage Railway are able to operate a practical shared service on days, when the heritage railway is in operation. As was demonstrated yesterday by South Western Railway’s Class 159 train, operation between Corfe Castle and Wareham stations, is not the most difficult of operations. The South Western Main Line is not the busiest of routes through Wareham station. There is a cross-over to the West of the station. These allowed the Class 159 train to use one of the through platforms to turnback. Would this continue, if say the Swanage Railway wee to run an hourly shuttle between Corfe Castle and Wareham stations? Look at this Google Map of Wareham station. Is there space on the Northern side of the station to add a bat platform, to allow the shuttle to terminate in its own platform? When I returned from Wareham to Waterloo, I just missed a train and I had to wait thirty minutes for the next train. The Wikipedia entry for Poole station, also says this. In 2004 proposals were drawn up for the current station buildings and footbridge to be replaced as part of redevelopment plans for the old goods yard. A hotel was to be built on the site of the current station building, however as of 2010 these plans have not progressed. So would it be feasible at some time in the future to terminate a Swanage service in a bay platform in the much larger town of Poole? 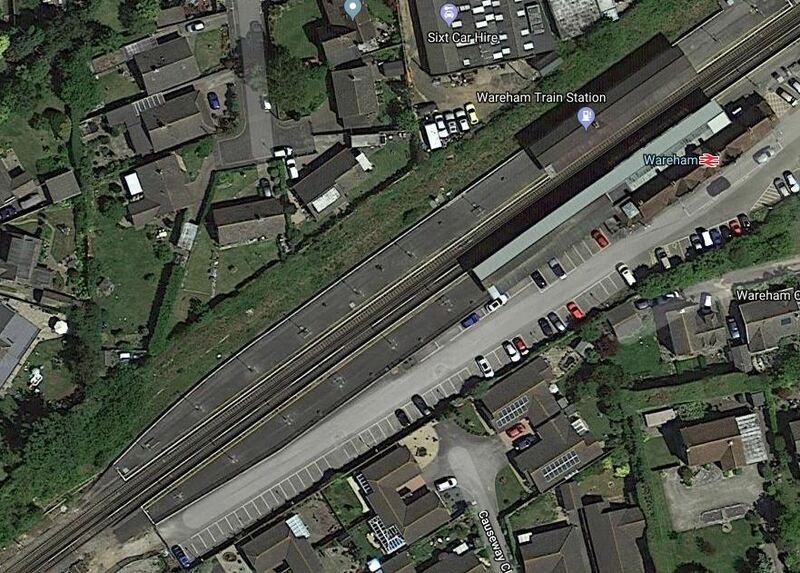 There are certainly possibilities to use Poole or even Bournemouth stations as a terminus of a service to Swanage station, that would also increase the frequency on the South Western Main Line between Bournemouth and Weymouth. How Long Would A Train Take To Go From Wareham To Corfe Castle And Back? Looking at yesterday’s figures on Real Time Trains, the following times were achieved yesterday. Yesterday, the trains were waiting for a long time at Corfe Castle station, to fit with their two-hourly timetable and that of the steam trains on the other track. If you add in sensible turnback times at Wareham and Corfe Castle, I doubt that a round trip could be done in an hour, making it difficult to run an hourly shuttle between the two stations. How Long Would A Train Take To Go From Wareham To Swanage And Back? Using yesterday’s figures and the quoted times for steam trains between Corfe Castle and Swanage stations, we get the following times. Or a total of 89 minutes plus how long the turnround will be at Swanage station. I have a feeling that timetabling an hourly service could be difficult. What Rolling Stock Can Be Used? If the trains travel for more than a few miles on the South Western Main Line, being able to use the third-rail electrification would be useful. But they would also need to be self-powered on the Swanage Railway. So perhaps, a bi-mode would be ideal. As they have rather a heritage flavour, perhaps a Class 769 train would be ideal? There is a lot of potential to improve services on the Swanage Railway. I suspect that if South Western Railway and the Swanage Railway got into serious discussion, there will be a solution, that would be beneficial to both parties and all those who live and work in or visit Swanage and the Isle of Purbeck.